Calling all Aussie fans from Queensland and those heading to Queensland this March, you are invited to join the Brisbane Tolkien Fellowship for Tolkien Reading Day 2015. The Brisbane Tolkien Fellowship is excited to announce their annual presentation for Tolkien Reading Day for the fourth year in a row. 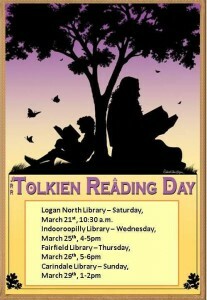 The 25th March celebrates the annual Tolkien Reading Day, which commemorates the date on which Frodo and The Fellowship were successful in destroying the One Ring and defeating Sauron. Tolkien Reading day takes place worldwide as an act of recognising the achievements of J.R.R. Tolkien throughout his life. As this year’s theme is ‘Friendship’, The Brisbane Tolkien Fellowship will be doing friendship readings and role-play from the prolific authors works, as well as discussing the history of Tolkien and his books. The Fellowship is led by Peter Kenny who is an expert on Tolkien’s writings and has also been acknowledged as one of the biggest Tolkien fans in the world. With one of the most comprehensive Tolkien collections globally, Peter Kenny is sure to make these Tolkien readings as magical as Middle-Earth itself. To find out more information please contact Peter on 0437353254 or petken27@bigpond.com or head to www.brisbane.qld.gov.au and follow the links to your closest library for all scheduling.